Flow chart illustrating the steps to the scientific method. Science consists of three aspects: first, it provides systematic descriptions of everything in the world and all of human experience, generally considered as scientific knowledge. Second, there are the men (and in more recent times, women) of science who have amassed these descriptions and communicate them to everyone else. Third, there are the methods by which they carry out this work (see scientific method). Science can be divided into two areas: natural science, dealing with the physical, natural world, and social science, dealing with society and human nature. People who study science are called scientists. Most of the early scientists who started many of the scientific fields, and some of history's greatest thinkers, such as Galileo Galilei and Isaac Newton, believed in God, or some other higher power, and many were creationists, although the ideas of evolutionism or Darwinism were not yet popular. In addition, Christianity played a pivotal role in the development of modern science (see Christianity and Science). With further scientific advancement, the scientific approach has become increasingly atheistic, rejecting the supernatural. Scientific fields of study observing a clear atheistic bent include evolution, global warming and much of cosmology and geology, which are based on a time frame which predates the Christian time of creation. There are hubs of real scientific research, however, in places like the Institute for Creation Research and the Heartland Institute. Science differs from other methodologies of classifying knowledge in that a scientific theory is a description of the world which in principle is capable of being disproved; this is known as falsifiability. It is this property which distinguishes science from other possible methods of discovering knowledge. Epicurus is an important figure in the development of the scientific method. He insisted that nothing should be accepted except that which has been sufficiently tested through direct observation and logical deduction. Roger Bacon is hailed by many as the father of modern science. His focus on empirical approaches to science was influential. He wrote an encyclopedia, his Opus Majus. The basis of modern science is observation and hypothesis. It involves constructing the best theory to explain an occurrence based on the evidence at the time. 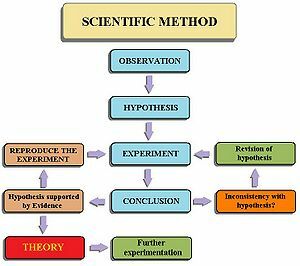 The scientific method consists of two stages, theory formation and theory testing. In the early 20th Century the scientific method was commonly understood to follow the inductive procedure, whereby general statements are derived from a collection of singular observations. It was thought that through this method theories were constructed; a collection of observations led to the formation of a general theory to explain them. Secondly, at the testing stage, it was considered that a hypothesis could be verified through a collection of singular observations. Karl Popper, considered by many to be the most important contributor to the philosophy of science in recent times, put forward a damning critique of induction, going so far is to claim that it did not exist. Popper argued that general theories cannot ever be conclusively verified by singular observations, but that such a theory could be conclusively falsified by such means. This theory is provisionally assumed to be true for the purposes of testing it. Assuming the theory is true, we can logically follow it through to a specific and inevitable outcome, a prediction, which becomes the hypothesis. In order for the hypothesis to be considered scientific it must be falsifiable. The hypothesis is repeatedly tested empirically. If the observations do falsify the hypothesis then we reject it in its current form. The theory, or at least parts of it, can then be modified, or a new theory proposed, which takes us back to the beginning of the process. Since verification of general theories is logically impossible, science is not, as many believe, a body of accumulated 'facts', but rather a collection of theories that have yet to be falsified. Via falsification we can move closer and closer to the truth, but since verification is not possible, we can never know if we ever reach the goal of 'ultimate truth' itself. Since the beginning of modern science, scientists have worked under the assumption that their subjects of study have been controlled by consistent natural laws. There is good evidence that this assumption was based on the Christian view that the laws were created by a consistent creator Who didn't change those laws on a whim. This assumption is seen as a prerequisite for logical deduction to act on the observations made. Without the assumption that the universe is consistent we cannot apply the lessons drawn from an observation to any area other than the observations themselves. If a chemical reaction occurs in a given solution in a laboratory in one city it is assumed that the same reaction can occur in a different laboratory in a different city on a different day because the chemical solution and situations will be the same. If a capricious supernatural force was to enter the equation they could not be controlled for and could not be studied. The physical sciences largely concern themselves with questions involving the natural, not the supernatural, but this is not the same as assuming that the supernatural does not exist. In addition, there are also the social sciences like history. Christian apologists maintain that history testifies to the supernatural existing and that the physical sciences (such as Biblical archaeology) can aid in historical determinations and testify to the existence of God and the truth of biblical Christianity. Three broad philosophies have developed in the scientific community. "Methodological naturalism" adheres to naturalism insofar as it concerns scientific experiments and observations, but does not rule out a personal deity. It does, however, a priori rule out the supernatural being an explanation for observations. "Philosophical naturalism" adheres to the belief that there is no beings or forces beyond what can be observed; this atheistic view rejects the supernatural, or is skeptical of such beliefs. The third approach is to follow the inference to the best explanation regarding whether or not a supernatural or natural cause best explains a past or present observation. For example, this third approach is advocated by creation scientists and intelligent design theorists when it comes to the origins of the natural world. Creation scientists and intelligent design theorists rightfully maintain the falsity of the evolutionary position given the lack of evidence for evolutionary position and the many lines of evidence against the evolutionary position. Another example is that the first and second laws of thermodynamics argue against an eternal universe, and creation scientists claim that these laws point to the universe being supernaturally created. But in other respects, such as why Krakatoa exploded, a natural explanation would be considered the best explanation. Historian and professor of religion Eugene M Klaaren holds that "a belief in divine creation" was central to an emergence of science in seventeenth century England. The philosopher Michael B. Foster has published influential analytical philosophy connecting Christian doctrines of creation with empiricism. Historian William B. Ashworth has argued against the historical notion of distinctive mind-sets and the idea of Catholic and Protestant sciences in "Catholicism and early modern science." Historians James R. Jacob and Margaret C. Jacob have published the paper "The Anglican Origins of Modern Science," which endeavors to show a linkage between seventeenth century Anglican intellectual transformations and influential English scientists (e.g., Robert Boyle and Isaac Newton). Two well-respected theological surveys, which also illustrate other historical interactions between religion and science occurring in the 18th, 19th, and 20th centuries, are John Dillenberger's Protestant Thought and Natural Science (Doubleday, 1960) and Christopher B. Kaiser's Creation and the History of Science (Eerdmans, 1991). When natural philosophers referred to laws of nature, they were not glibly choosing that metaphor. Laws were the result of legislation by an intelligent deity. Thus the philosopher Rene Descartes (1596-1650) insisted that he was discovering the "laws that God has put into nature." Later Newton would declare that the regulation of the solar system presupposed the "counsel and dominion of an intelligent and powerful Being." University of California at Berkeley-educated historian Ronald L. Numbers has stated that this thesis "received a boost" from mathematician and philosopherAlfred North Whitehead's Science and the Modern World (1925). Numbers has also claimed "Despite the manifest shortcomings of the claim that Christianity gave birth to science—most glaringly, it ignores or minimizes the contributions of ancient Greeks and medieval Muslims—it too, refuses to succumb to the death it deserves. The sociologist Rodney Stark at Baylor University, a Southern Baptist institution, is only the latest in a long line of Christian apologists to insist that 'Christian theology was essential for the rise of science.'" ↑ Soanes and Stevenson called science "the intellectual and practical activity encompassing the systematic study of the structure and behavior of the physical and natural world through observation and experiment."Soanes,C. and Stevenson, A. (eds.) (2005) 'The Oxford Dictionary of English (revised edition)' Oxford University Press, Oxford, U.K. This page was last modified on 9 April 2019, at 16:04. This page has been accessed 106,362 times.